With the three primary colors red, green and blue, one can create an entire palette. When fluorescent proteins in combinations of these colors are inserted into bacterial colonies, the resulting patchwork can report on the success of systems containing synthetic pathways, offering quick insight into the imbalances they provoke and point to means of fine-tuning their expression. 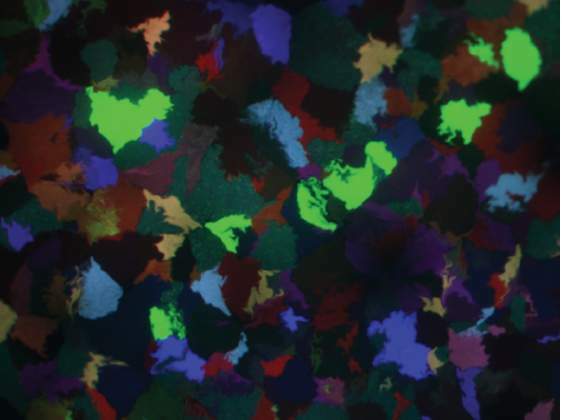 The E. coli colonies in the image produced by Prof. Milo and his colleagues have irregular shapes where they abut other colonies; colonies in which the expression of the fluorescent proteins was weak appear black. 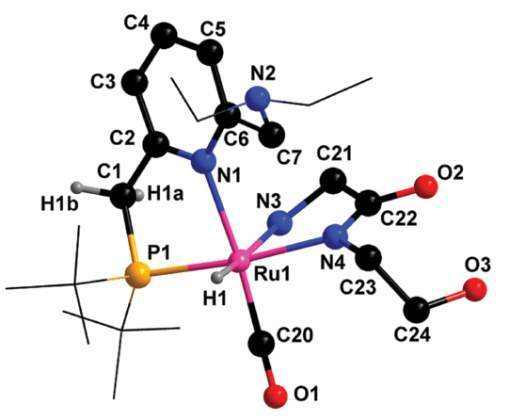 ruthenium complex involved in the catalytic process. Illustration of the chiral induced spin selectivity (CISS) effect. Chiral molecules that have screw-like symmetries – that is, they spiral around in a right-or left-handed direction – can be used to select electrons with a particular spin. 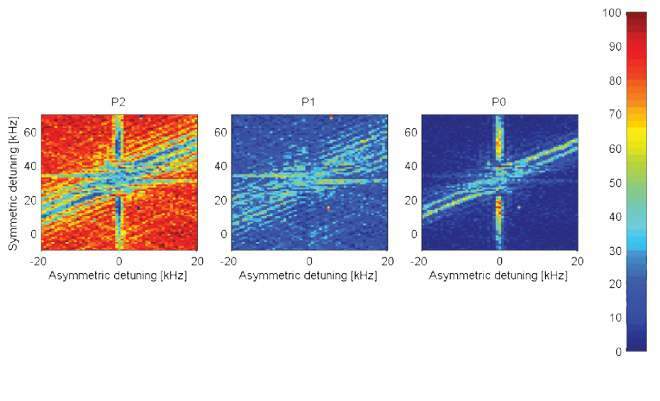 Such “spin filters” as those developed by Prof. Naaman and his colleagues could prove useful in the field of spintronics, in which data is stored and computation is performed by the electrons’ spin instead of their charge. Preclinical research often involves imaging the internal organs of small animals, sometimes on different days or with different methods. 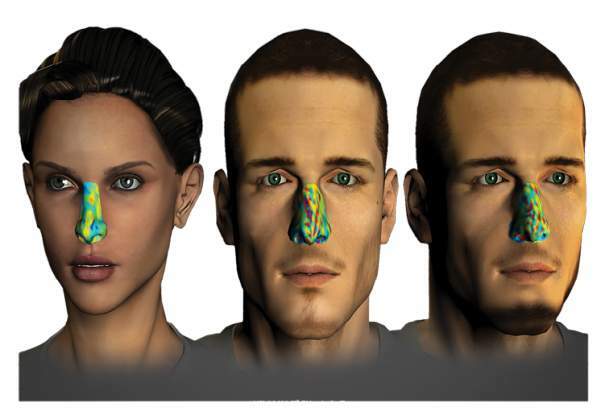 Prof. Neeman and her colleagues developed a method for the automated extraction of anatomical features by segmenting the images according to the intensity of the signals. This enabled the researchers to merge data from such systems as MRI and CT, and images from different days, producing multimodal imaging. How long does it take for a lengthy, complex molecule known as messenger RNA (mRNA) to be copied from the DNA in the genome? The researchers, Profs. Oren and Amit, and their colleagues developed a method for measuring the rate of mRNA production in live cells on a global scale. The method entails stopping the process – transcription elongation – adding a label, and then allowing elongation to continue. Harvesting RNA at different time points and checking the progression of labeled strands yields an overall rate for numerous genes. To visually reconstruct a hidden object, Prof. Oron and his colleagues turned to interference – between measurements of the way light scatters off an object. In the figure, the images encoded in the interference pattern between two partial measurements, with the object partially illuminated, facilitates the reconstruction of the image (in this case, the letters WIS, not shown). A quantum logical gate, one of the basic building blocks for a quantum computer, was created by Prof. Ozeri and his colleagues with the help of a diode laser on two trapped atomic ions. The gate is intended for reversing one qubit (the quantum analogue of the classical bit) in accordance with the condition of another qubit. 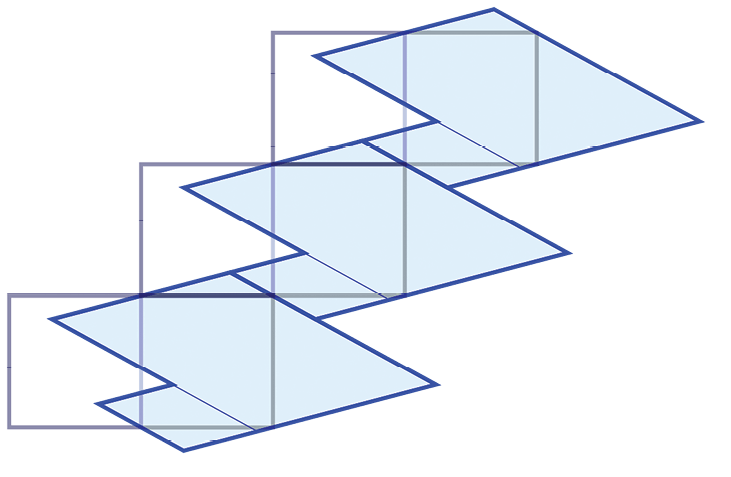 This operation requires the two qubits to interact, or “sense” one another. The result of the gate is the creation of an entangled state. The three images, based on experimental data, provide a graphical representation for the probability, expressed by color (red: high probability; blue: low probability) of finding the qubits: from left to right – in the 00 state, the 01 and 10 states, and the 11 state, as a function of gate parameters. 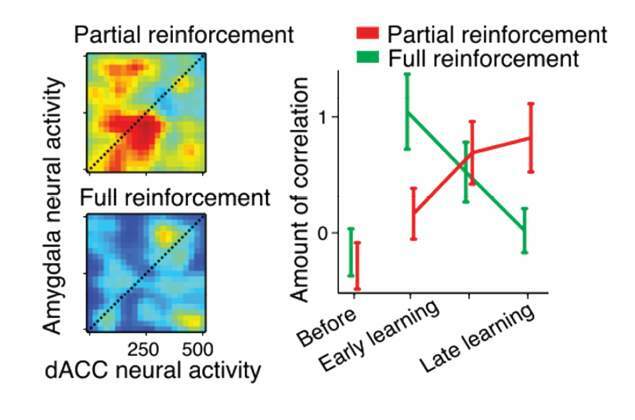 To understand how emotions are involved in learning and memory, Prof. Paz and his colleagues investigate the connectivity between brain regions, in this case the amygdala and the anterior-cingulate-cortex (ACC). In this study they investigated different types of negative reinforcement: partial, that is, a surprise, unwelcome stimulus; and full, when the outcome is predictable. The partial reinforcement was linked to higher connectivity and less ability to forget the lesson – a factor that could play a role in post-traumatic stress disorder (PTSD). The discovery of the Higgs particle in the Large Hadron Collider (LHC) confirms the accepted theory about the origin of the mechanism by which the mediators of the weak interaction acquire their masses. Nonetheless,the origin of the masses of the matter particles, the building blocks of nature, called fermions and presence of the large hierarchy between the three generation of quarks remain unanswered. 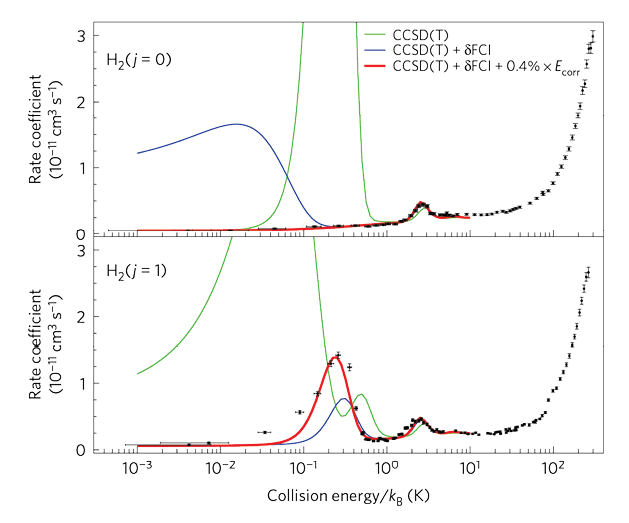 Prof. Perez and his colleagues have now proposed a method to use the LHC to probe the Higgs coupling to the light quarks that is expected to be behind the origin of their masses, which had been thought to be nearly impossible in the LHC “noisy” environment. A number of ribosomes move down a strand of messenger RNA at once, translating the gene code into protein as they go. What prevents “traffic jams?” Prof. Pilpel and his colleagues found a code that slows down the translation process at the beginning, like “ramp meters” on highway entrances. In the image showing the speed of mRNA translation across species, (where green is slow, red fast), the evolution of this code can be seen. Soil, sand, rocks or glasses – all are disordered systems liable to be under pressure. Computing the forces acting between all the particles from knowledge of their positions alone was considered an insoluble problem: The mechanical constraints are that the sums of forces acting on each particle must vanish, but the number of individual forces is larger than the number of these constraints. 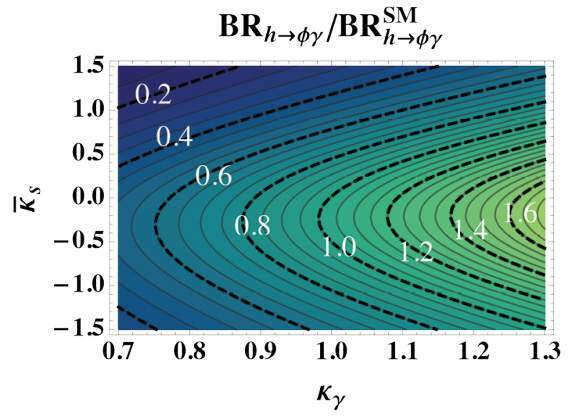 Prof. Procaccia and his colleagues solved this theoretical problem. The figure shows an experimental system that can demonstrate the solution: The system is composed of plastic disks that, under applied pressure, rotate polarized light in a manner that is related to the amount of force applied to the disks. Such systems enable the researchers to test their theory against experimental evidence. 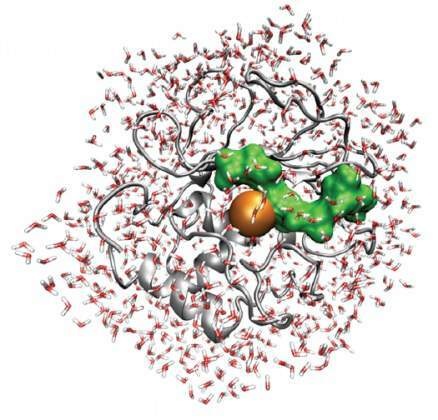 An image showing the atomic structural model of an enzyme, MT1-MMP (gray ribbon), its collagen substrate (green) and surrounding water molecules (red/white stick presentation). Prof. Sagi, Dr. Martina Havenith and their colleagues, in a series of experiments, have uncovered the dynamics of this family of proteases – proteincleaving enzymes – showing exactly how the small water molecules in their environment affect their kinetics. These findings will assist in the design of drugs to block certain proteases, for example, those that help cancer cells spread. 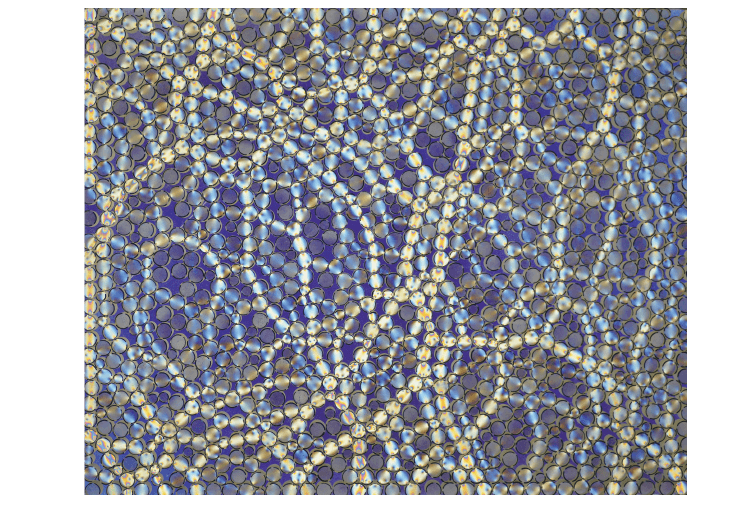 Metastatic cells degrade their surroundings to break free. 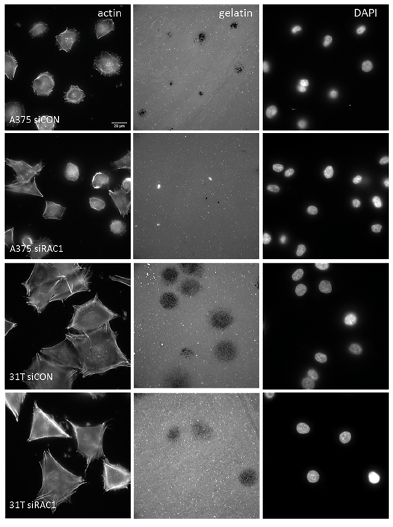 Cell lines derived from a melanoma patient, stained for actin (left), and fluorescently labeled for extracellular matrix, reveal massive degradation of the matrix in the middle panel (black holes) and cell nuclei in the right. The study conducted by Profs. Samuels and Geiger, and their colleagues revealed that the invadopodia – cancer cell protrusions needed to degrade the surrounding matrix – are regulated by one of the main melanoma driver genes, RAC1. Take a circle, divide it into two equal halves, and randomly choose a point, X, on the circle. Now start rotating X by a fixed angle, alpha. Every time the rotated point falls in one half of the circle take a step to the left, and every time it falls in the other half of the circle take a step to the right. You have now taken a "random walk." The figure, from research by Prof. Sarig and his colleagues, depicts two possible representations of an infinite translation of surfaces. The joint activity patterns of neuronal electrical signals are “words” in the language of the brain. Prof. Schneidman and his colleagues investigated the “semantic” organization of these activity patterns in the vertebrate retina as they were shown either artificial (left) or natural (right) movies. 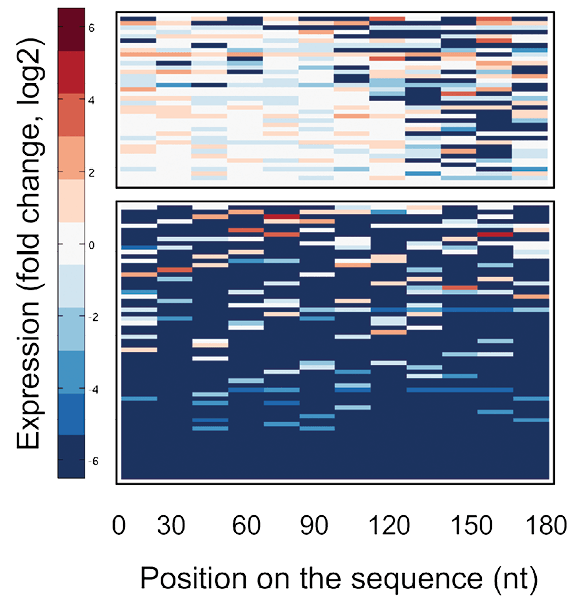 The top matrices plot the similarity in meaning between neural words of a group of cells responding to the same stimuli, revealing “synonyms.” Small charts: active neurons emitting electrical pulses (black) corresponding to the columns in the matrix above. 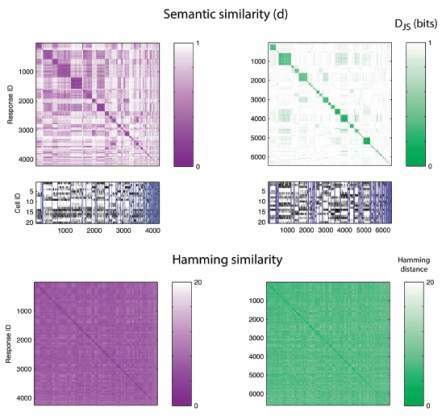 Bottom: An intuitive matrix of the overlap of neural words based on their syntactic similarity does not reveal synonyms, demonstrating that the language of our brain has a semantic design that resembles natural language much more than we might have expected. Prof. Schuldiner and her colleagues discovered a protein, Pex9, and uncovered its role in an organelle in the cell called a peroxisome. The peroxisome is where fat is burned and converted to utilizable energy; when this organelle does not function, the result can be devastating neurological diseases. Using the robotic setup in her lab, the researchers found that Pex9 brings a certain group of proteins into the peroxisome. In the image, a green fluorescent protein was engineered to have a piece of a Pex9-targeted protein added to it. When Pex9 is overexpressed in cells (right), this protein targeting can easily be observed. During development, neurons grow long processes that are often pruned back and later regrow to form the functional neuronal circuit. Investigating this process in fruit flies, which undergo several stages of growth, degeneration and regeneration from larvae to adult, Prof. Schuldiner and his colleagues discovered that a gas, nitric oxide (NO), acts as a switch between the two processes. 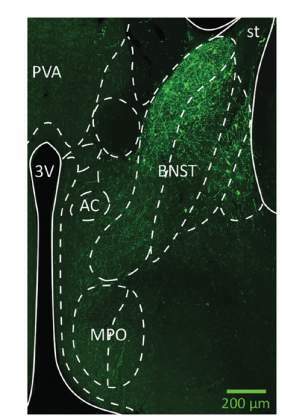 In the fruit fly brain region pictured, axons (green) exposed to low NO grow well (right) while those exposed to high NO levels (left) do not. Schuldiner notes that this activity shares some similarities with nerve repair following injury. Immune | memory aging Can immune system rejuvenation enable restoration of age-related memory loss? Prof. Schwartz and her colleagues discovered a unique interface that facilitates communication between the brain and the immune system – the choroid plexus epithelium, found within the blood-cerebrospinal fluid barrier. The image, of the choroid plexus, reveals reduced ability to enable immune cell passage to help the diseased brain, which may be a key factor in Alzheimer’s and other neurodegenerative diseases. Prof. Segal and his colleagues mutated different regions of messenger RNA (mRNA) molecules in order to discover molecular elements that attract the ribosome, the proteinmaking “factory.” Each row represents a different mRNA molecule; each column represents a mutated region. Highlighted in blue are the regions that were found to affect protein manufacture. 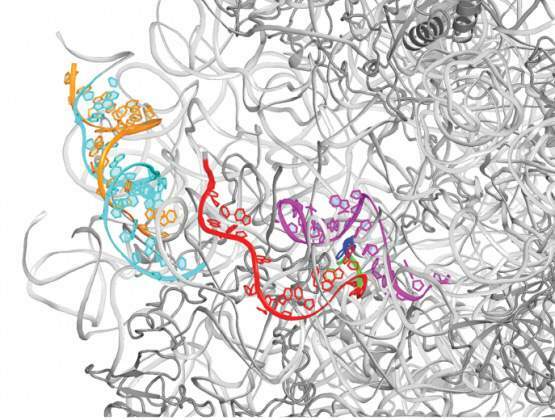 Using this approach, the scientists identified two types of mRNA sequences that attract ribosomes. The history of an organism’s cells, from the fertilized egg up to any moment in time, can be captured by a lineage tree. Prof. Shapiro and his colleagues have developed a method for reconstructing cell lineage by examining mutations in the highly variable regions of the genome. 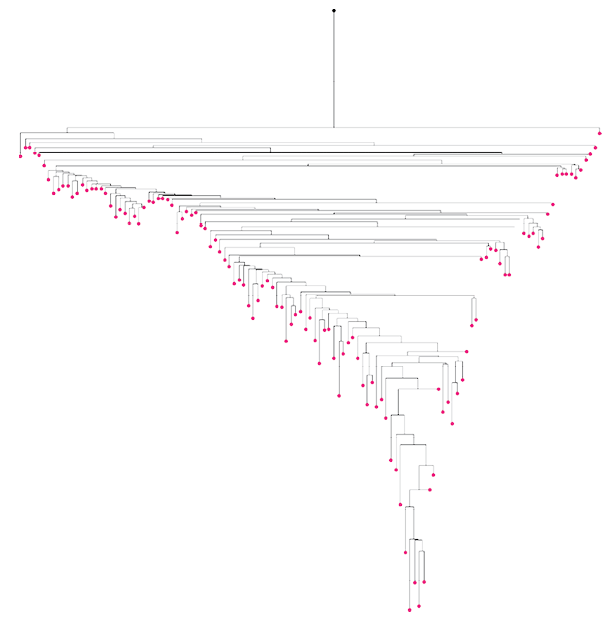 The figure shows a mouse lineage tree for cells from the large intestine, represented by pink dots; the lines mark the progeny relations among them. Advanced mass spectrometry enabled Prof. Sharon and her colleagues to discover a new subunit for one of the cell’s machines – the signalosome complex. This complex regulates ubiquitination – the “tagging” process by which proteins are sorted for recycling. 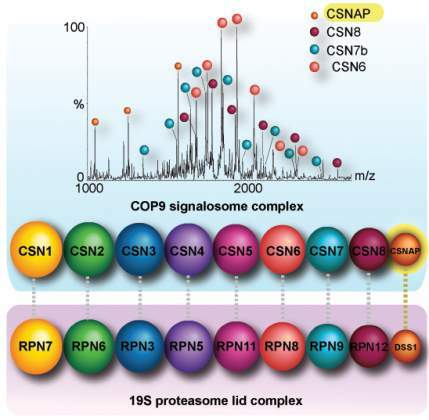 CSNAP, as the group named it, adds to the other eight known subunits of this important complex, and their findings show that this subunit, which had evaded detection for decades, probably because of its small size, is crucial for the signalosome function. Often viruses seem to “choose” between two states: the direct, quick attack and a more dormant state. Prof. Sorek and his colleagues, working with viruses called phages that attack bacteria, discovered a means of communication used by the viruses to inform these decisions. 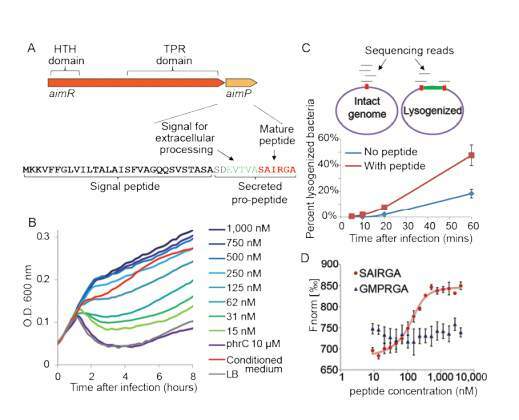 A peptide they name arbitrium is deposited into the environment for other viruses to find, letting each generation know how the infection process is proceeding and what their best strategy entails. 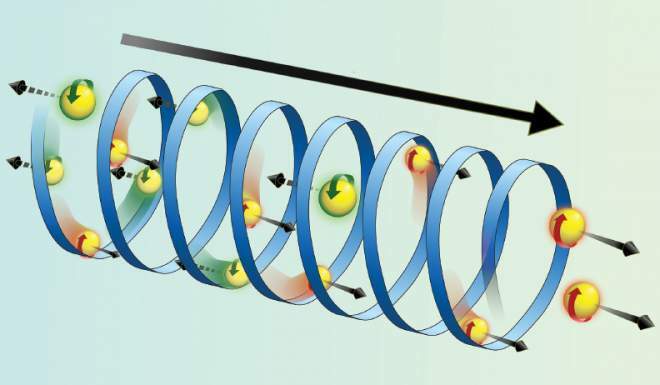 Illustration of coupled quantum wires in a magnetic field. This theoretical study conducted by Prof. Stern and his colleagues investigates the way in which the interactions of electrons with one another and with the magnetic field lead to so-called quasiparticles – particles which are made of electrons, yet carry a fraction of an electron's charge. Such fractional charges may, among other things, be used to compute and store information in the future. Genes packed into chromosomes in the cell nucleus can exchange information with their close neighbors, and this may have an effect on the organism, including the development of disease. To understand which genes interact in this way and how, Prof. Tanay and his colleagues froze chromosomal elements, isolated DNA fragments, and inserted DNA “barcodes” into the segments. 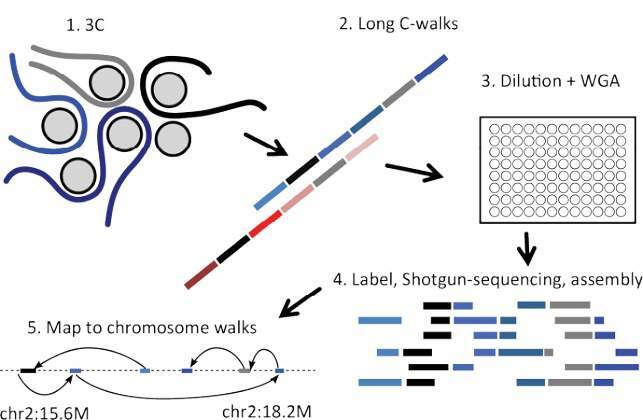 High-throughput sequencing and computer modeling techniques enabled the researchers to identify multiple genes that showed up together in the analysis of the fragments, and thus interacted. 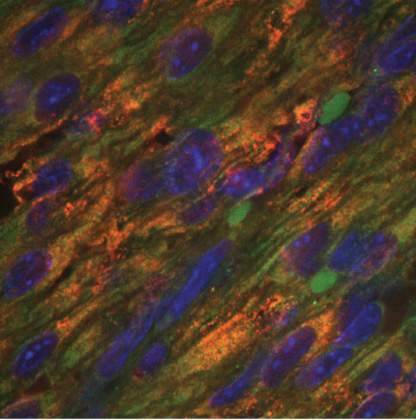 A section of the heart of a day-old-mouse shows the receptor ERBB2 (red), cardiac troponin (green), and cell nuclei (blue). Prof. Tzahor and his colleagues found that ERBB2 is involved in cardiomyocyte (the contracting cells in the heart) growth and renewal. Its levels diminish soon after birth. Reintroducing this protein after injury to the heart in mice promoted heart regeneration. How do bats – mammals that fly in all directions – navigate that space? By mapping the three-dimensional flight paths of bats (pictured) and tracking the neurons in their brains as they navigated toward a goal, Prof. Ulanovsky and his colleagues found that the “place cells” in the hippocampus brain regions of bats represent all three axes in space equally, with the same sharp resolution. 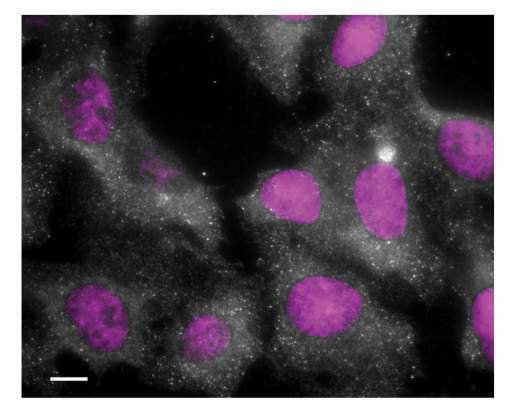 Dr. Ulitsky and his colleagues discovered a long-noncoding RNA called NORAD that works in the cytoplasm of the cell, as revealed in the dots in this image (the nuclei are stained purple). NORAD increases the expression of other RNAs, especially those that regulate genes for cell division; when NORAD is deleted, the result is an accumulation of cells with an incorrect number of chromosomes. How do we recognize objects from blurred or partial images? Answering this question has fundamental implications for understanding the visual system and for constructing machine vision applications. Prof. Ullman and his colleagues discovered that there are “atomic” units of recognition that are basically the same for all of us. A minute change to an atomic image turns it from recognizable to puzzling. 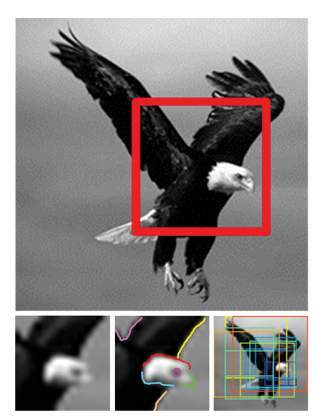 This is demonstrated in the figure, bottom left, in which the image of the eagle, (see top, red frame) is at the lower limit of recognizability. The center image shows the detailed internal interpretation of the participants; and the colored frames in the right-hand image represent additional “atomic” images that can be lifted from the original. Prof. Vardi, Dr. Shilo Rosenwasser and their colleagues show that, far from being passive drifters in the ocean, phytoplankton sense their environmental conditions and respond accordingly. 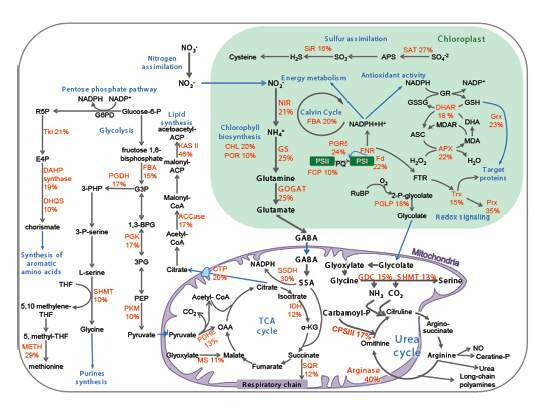 In this figure, they reveal a metabolic map of diatom cells, identifying specific enzymes that are sensitive to oxygen radicals, including the nitrogen pathways. Elucidation of the function and regulation of these key metabolic pathways can help reveal the molecular, ecological secrets underlying large scale algal blooms in the ocean. Drs. 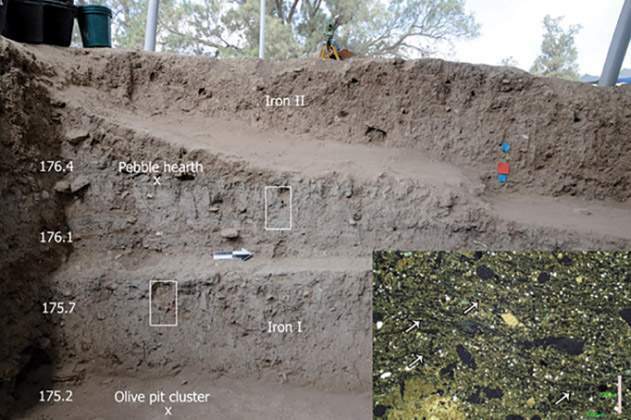 Yotam Asscher and Elisabetta Boaretto, and Prof. Weiner and colleagues performed radiocarbon dating at the Tell el-Safi/Gath archaeological site, occupied by the Philistines in the Iron Age. They found that the Philistines had appeared at this site earlier than previously thought – in the late 13th century BC. In the image: A cross-section revealing some of the sediment layers that were dated. The inset shows a high magnification view of the sediments. Lipoproteins – proteins-lipid complexes that carry cholesterol and triglycerides in the blood – have numerous functions in the body. Dr. Yaniv and her colleagues investigated the role of lipoproteins in angiogenesis – the growth of new blood vessels. 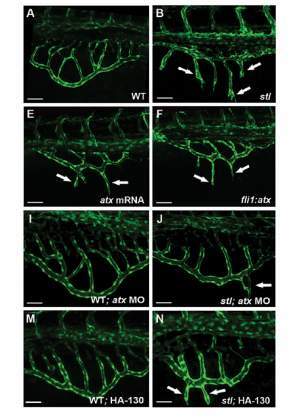 In the images, a mutation in the lipoprotein signaling cascade causes the excessive growth of blood vessels in the zebra fish embryo. 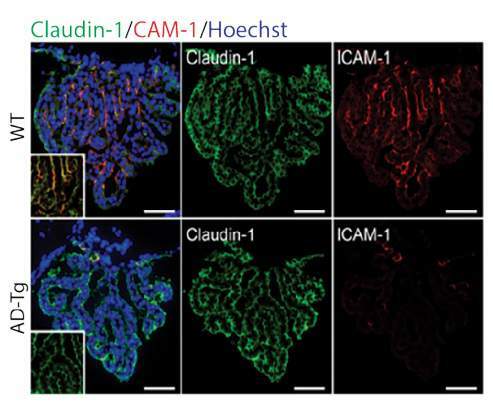 These experiments led the group to discover Atx, which mediates this cascade, providing new insights into the connection between lipids and angiogenesis. A hallmark of aggressive cancer is the hijacking of growth factors. Prof. Yarden and his colleagues asked whether these growth factors, like many substances in the body, are tied to our biological clocks. Indeed, they found that growth factors are mainly active at night; the hormone cortisol suppresses their activity in the daytime. The three figures show how a growth factor, EGF, enhances cell migration, and cortisol (DEX) inhibits that migration. The conclusion: Anticancer drugs that repress growth factor activities might be more effective at night. Using light to control neurons in the brains of live mice – optogenetics – enables Dr. Yizhar and his colleagues to turn them on and off and to understand how they connect to other parts of the brain. In this image, neurons in a brain region called the “basal nucleus of the stria terminals” have been labeled with a fluorescent protein, revealing their activation in behaviors linked to stress recovery and coping with anxiety. Many antibiotics attack the ribosomes of bacteria, preventing them from manufacturing proteins. The image, from research by Prof. Yonath and her colleagues, shows a part of the backbone (in gray) of the large ribosomal subunit of the bacterium S. aureus, a common pathogen that is, in some cases, resistant to multiple antibiotics. 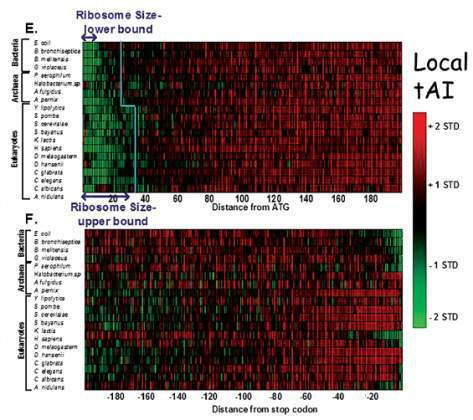 The colors highlight ribosomal RNA regions that exhibit fold variability compared with other, non-pathogenic bacteria, and the green crescent delineates a location that could be exploited with designed antibiotics. This theorem describes the extreme values of a random field, which is the characteristic polynomial of a random matrix. The theorem demonstrates, in one particular case, a phenomenon that is the focus of Prof. Zeitouni and his colleagues’ research, namely, finding that the behavior of the extrema of random fields which are logarithmically correlated is universal, and does not depend on details of the field or whether it is Gaussian. Superconducting QUantum Interference Devices (SQUIDs) are used as sensors capable of demonstrating record sensitivities to small magnetic signals. Prof. Zeldov and his colleagues have designed a SQUID that simultaneously measures two magnetic field components. It can serve for mapping current flow on a nanometer scale or for measuring isolated magnetic nanoobjects. The figure shows that experimental interference patterns (left) of the electric current flowing through the sensor, used to calibrate the device, match the theoretical predictions of these patterns (right). Our experience of familiar environments is not static but changes over time. Dr. Ziv and his colleagues discovered “timestamps” – specific patterns of neuronal activity that add a point in time to even the most routine experience. 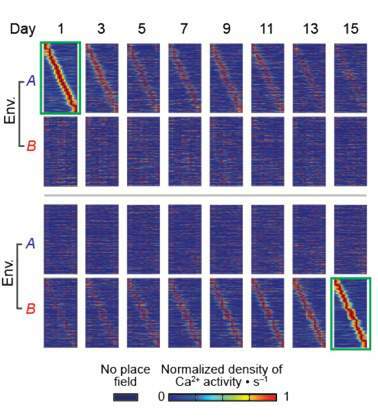 These patterns, shown in the brains of mice over a period of weeks, gradually changed over time so that, regardless of the spatial context, timestamps of events that occurred close together were highly similar, whereas timestamps of events that occurred farther apart were distinct. The findings suggest a mechanism by which the brain creates a mental timeline of experienced events, associating or disassociating them in memory by their temporal distances from one another. 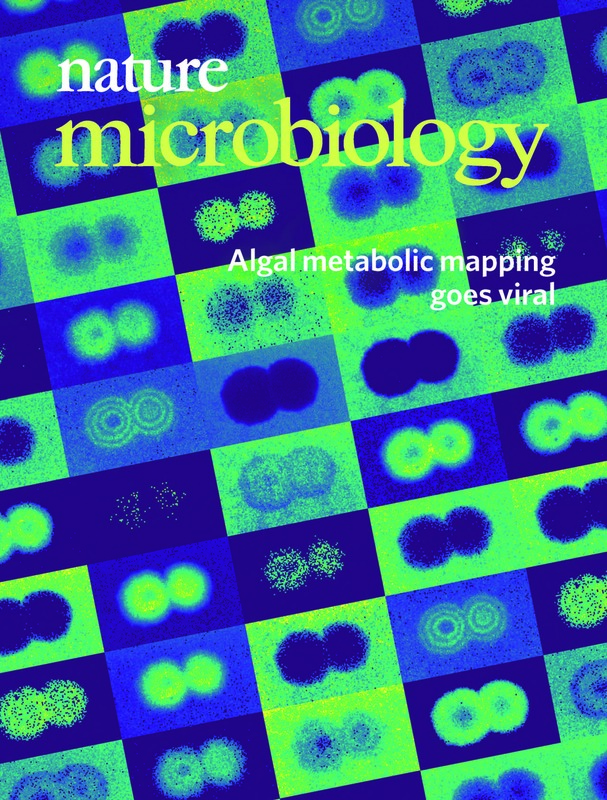 Featured on the cover of the March 2019 issue of Nature Microbiology is the research of Prof. Assaf Vardi and PhD Student Guy Schleyer of the Weizmann Institute of Science’s Plant and Environmental Sciences Department. By combining a classical technique in microbiology, the plaque assay, with state-of-the-art mass spectrometry imaging, the scientists have developed a new approach in visualizing the dynamics of infection of the bloom-forming alga, Emiliania huxleyi, by its specific E. huxleyi virus (EhV) as it evolves in real time. A viral plaque – circular regions of destroyed cells – originates from a single infected cell, from which the virus propagates to the neighboring cells. By applying advanced mass spectroscopy imaging to the plaques, the scientists were then able to produce color intensity patterns of metabolite abundance during infection. 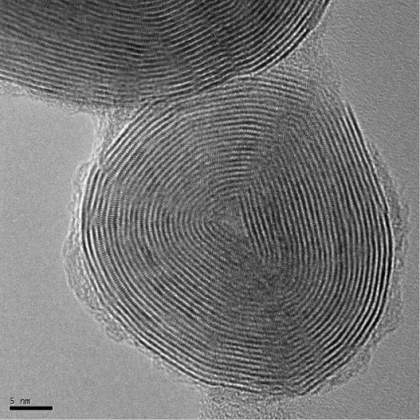 They specifically looked at different lipids (some are presented in the image), which are thought to play a role in host-pathogen interactions. As can be seen from the images, the abundance of each lipid has a unique spatial distribution pattern. This novel technique captures the infection process in one snapshot, providing time-sensitive information about the different stages of infection. In expanding the understanding of host-virus interactions and defense strategies, this new approach will hopefully not only help assess the metabolic state of infection of algae in the marine environment, but could also potentially be applied to other host-pathogen model systems, including human diseases.